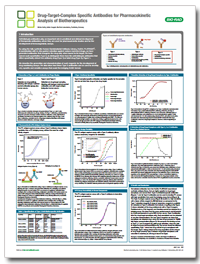 This poster demonstrates how Bio-Rad generates antibodies that recognize monoclonal antibody drugs when bound to their target, using the HuCAL PLATINUM® library and in vitro guided selection. We have named such specificities Type 3, to distinguish them from the anti-idiotypic antibodies that either specifically detect free antibody drug (Type 1) or total drug (Type 2). We describe the generation and characterization of such reagents for the development of drug monitoring assays, and show how these Type 3 antibodies can be used to develop very specific and sensitive assays that avoid the bridging ELISA format. Read more about using HuCAL technology to generate antibodies to biosimilars and novel biotherapeutics for the development of bioanalytical assays.